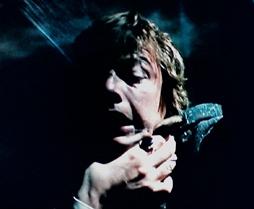 It starts when Angelique bites Joe Haskell’s cousin Tom, who then dies in the hospital after Joe, who has also been bitten and is in thrall to Angelique, leaves the window open so that she can get at Tom a second time. Barnabas, who isn’t a vampire at present, doesn’t know that Angelique is the new vamp in town, but he knows that there is one and that Tom will soon rise from his grave; he tells Willie to sharpen a stake. They head over to the cemetery the evening after the funeral but arrive too late to deal with Tom–his grave is empty. While Barnabas and Willie are out hunting for him, Tom the Vampire comes to the old house. Dr. Julia Hoffman is alone down in the basement, working in the laboratory she set up to create a new girlfriend for Adam. Julia used to be much better with vampires when she was managing Barnabas, but Tom is a complete stranger to her. She can’t fend him off and he bites her. When Willie finds her on the floor a short time later, he doesn’t see the fresh teeth-marks on her neck since she’s wearing a high-collared blouse under her lab coat. She doesn’t tell him what happened and asks him not to tell Barnabas, but Barnabas gets the story of the supposed fainting spell out of Willie after Julia goes back to Collinwood to lie down. 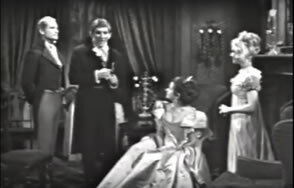 As Joe is with Angelique and Willie, Maggie, and Carolyn were with Barnabas, Julia is now enthralled to this vampire who speaks all his lines in such a stilted manner. (Maybe it’s the fangs hindering his speech?). Whenever he calls out to her, she goes to him and gets bit again. This goes on for two or three days, but Barnabas soon figures out what’s going on. After all, he knows all the signs of a vampire’s victim, including that tell-tale scarf wrapped high around the neck. He confronts Julia about it and tries to help her, but the call of Tom the Vampire is impossible to resist. Barnabas, on the other hand, can’t stand to see Vicky suffer and goes over to Collinwood to insist she tell him. During their conversation, there’s an interesting little exchange where Vicky asks why Angelique hates Barnabas so much, and he explains that it must be because he looks so much like his ancestor. Vicky remembers that that Barnabas died in 1795 soon after his marriage to Angelique and didn’t go to England as the family history has it, but she doesn’t take the next step and wonder how modern-day Barnabas could therefore be descended from him. She does eventually agree to tell Barnabas her dream. After he’s heard it, he goes home, takes a sleeping pill, and sits down in his armchair in the drawing room. Now it’s his turn to dream. He’s certain that he won’t die afterwards, but that the old curse will return and he’ll become a vampire again. Before he falls asleep, he asks Julia Hoffman to please drive a stake through his heart to prevent him from becoming that monster. He also sinks his teeth into Josette. Not that he intends to at first–he only wanted to warn her away from Collinwood before Angelique’s curse destroyed her too–but now that he’s a vampire, his impulse control has pretty much disappeared. He keeps coming back to her, not simply to feed but to try and make her a vampire as well. Though her family tries to protect her from a danger they don’t fully comprehend, she’s more than willing to go to him, even to the point of slipping out of the house via a secret panel in her bedroom. Of course, this ends badly. Josette can’t escape her fate. While wandering the cliff top, she encounters the apparition of Angelique, who shows her a pale and ghastly vision of herself as Barnabas’s vampire bride. Horrified, Josette flees and heads straight off the cliff to fulfill that destiny we’ve been hearing about from the first time her name came up in the earliest episodes. If you were worried about Barnabas’s witchy wife Angelique being buried alive, don’t be. It takes more than a premature burial to keep her down. Angelique is dug up and rescued by the Collinses’ indentured servant Ben Stokes, whom she has ensnared with her spells, before she’s even out of breath. Unfazed by having a dead man come up out of his grave to try to kill her (I guess that’s just the sort of thing that happens when you’re a witch), she is soon focused again upon her ultimate purpose of making Barnabas love her or else destroying him and his entire family–one or the other; she fluctuates wildly between the two from episode to episode, which makes her motivations seem a tad inconsistent. Meanwhile, Vicky Winters has been arrested for witchcraft due to her 1960s clothes, her odd behavior while adjusting to being thrown over 170 years back in time but still seeing the same familiar faces all around her, and her foreknowledge of certain events. Also, Angelique needs a scapegoat to draw attention away from herself, and poor hapless Vicky is certainly the best candidate. Vicky does, however, have a few friends. Naomi Collins is as kind and supportive as Elizabeth Stoddard-Collins always was. She also gains a cute young law student named Peter Bradford as her advocate. Barnabas also believes her innocent–at first because he doesn’t believe in superstitious nonsense like witches, then because he suspects who the witch really is. It’s Angelique’s unwilling henchman Ben who finally gives her away, using his new-found basic literacy skills by writing down her initial for Barnabas; he too is sympathetic to Vicky’s plight. This is where Barnabas’s downfall truly begins. Once he’s certain that his bride is in fact a witch, Barnabas decides to put a stop to her before she can do any more harm. An attempt at poisoning her wine doesn’t work; a plan to stab her is likewise thwarted. By this time, Angelique is aware of his plotting against her and tells him plainly that if he doesn’t knock it off, Josette will be the next one to die. Instead of giving up his plans when faced with this threat, Barnabas first tries to get Josette safely away from Collinsport before he carries on. With some variation, this is the new opening voiceover for every episode of Dark Shadows. Since the character of Victoria Winters has been sent back into the past to witness the beginning of the unhappy story of Barnabas Collins and his family, actress Alexandra Moltke no longer does these introductory speeches and the other women in the cast take turns with it. Sometimes, it’s a voice I don’t recognize and I wonder if the woman speaking is a production assistant or perhaps the show’s director, Lela Swift? I have to note that when we were first introduced to Josette Collins in the very earliest episodes of Dark Shadows, and even when Barnabas first arrived, the key events of their lives and deaths were supposed to be happening in the 1830s. At some point in the narrative, the timeline shifted back about 40 years to the late colonial era, which is where Vicky suddenly and unexpectedly finds herself. Vicky has been in love with the past and dreaming about the history of Collinwood for some time, but she’s about to discover that the olden days weren’t all that great to live in. Not that we’ll see this at first. As we and Vicky approach the old Collins home when it wasn’t so very old, the initial impression is of a bright and cheerful place. There are flowers all around the handsome colonial house. Inside, the drawing room is painted pastel colors–pink and minty green. Barnabas, who seems like he might’ve once actually been a nice guy before that whole vampire thing, is out in the sunshine with his little sister Sarah, awaiting the arrival of his bride-to-be, Josette, from Martinique. Vicky is more than a little bewildered, not just by this information that contradicts what she knows of the Collins family history–that Josette was the bride of Jeremiah Collins–but also that this Barnabas who looks just like the Barnabas she knows in 1968 doesn’t recognize her. Poor Vicky’s bewilderment will only increase as she meets the rest of the family, who also look just like people she already knows. No wonder it takes so long for her to accept that she really is in the past; this double casting gives things a sort of Wizard-of-Oz “and you were there, and you,” dream-like feeling. The House of Dark Shadows is a film based on the popular soap opera, made in 1970 while the show was still running and while some of the original cast were still around. It’s a highly compressed version of the first 100 episodes or so starting with Barnabas Collins’s resurrection, with some events and characters rearranged. The film begins with Maggie Evans and another young woman whom I don’t know named Daphne searching for David Collins, first around Collinwood–which looks like a real house instead of a collection of flimsy sets. Then Maggie goes over to the abandoned old Collins house to look for the boy. Dialog will later establish that Maggie is David’s governess; Vicky Winters is long gone or else, in this version of the story, never existed. While at the old house, Maggie runs into Willie Loomis, who apparently works for the Collinses and in his spare time hunts for some long-missing jewels. He tells Maggie about an important clue to their whereabouts and, after David’s father Roger fires him a few minutes later, decides this is the right time to follow up by visiting the Collins family crypt. Willie doesn’t find the jewels, but he does find a coffin sealed with chains, which he opens… and the rest of the scene plays out pretty much as it did in the television version except that it’s in color. As in the television version of events, all we see of Barnabas is a ringed hand. Oh, and Daphne? No point in getting attached to her. While leaving Collinwood that evening, she walks down a long and spooky avenue of trees toward her car and becomes Barnabas’s first victim before we’re ten minutes into the movie. I wasn’t sure whether or not I was going to continue to write these reviews, but one unresolved story line prompted me to go on: What’s behind the locked door in the basement? This mystery was introduced in the very first episodes, when Victoria Winters wandered down into the basement on her first night at Collinwood, following the sounds of a woman’s sobs. Elizabeth Collins Stoddard refused to leave her home for 18 years because of whatever was in there. I didn’t remember this story at all from my childhood viewing–for awhile, I had the idea that that was where Barnabas’s coffin was hidden, and Elizabeth was keeping guard over a long-hidden family secret. But the secret behind that door isn’t as old as that. At long last, we’re going to get a peek inside. Although I’ve put the next series of Dark Shadows on DVD in my queue, I’m not sure I’ll be reviewing any more after this. We’ve come to the part of Dark Shadows that everyone who knows anything about the show is familiar with. There isn’t much else to tell: Willie Loomis, now played by John Karlen, continues to make himself repugnant by committing petty thefts around Collinwood and threatening the rest of the cast until even his partner-in-crime Jason is sick of it and wants him to go away. But you can’t push Willie around–Willie won’t go. He’s determined to stay around long enough to steal something expensive and shiny; jewels seem to be a special object of fascination for him. It isn’t the ring and medallion displayed in Barnabas’s portrait he’s after, however. According to Collins family tradition, Barnabas went to England and died there and presumably took his valuables with him. Further research into the family’s history, with David’s assistance, turns up the story of one Naomi Collins, a lady who was once given some gemstones by a pirate and wore them to her grave. Everyone except for David and Willie thinks that the pirate part of this story sounds silly, but they believe the part about Naomi being buried with her jewelry to be true. Willie is also urged on by the tell-tale sound of a beating heart, although it doesn’t seem to make him feel guilty about anything.